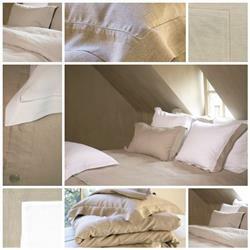 Victoria Bed Linens The Victoria bedding collection is PURE and SIMPLE. It's the perfect bedding collection for those who enjoy uncomplicated luxury. They're made from 100% linen, and are available in WHITE. The sheets, shams and pillow cases are finished with a small hemstitch. For matching fitted sheets and duvets, see our Classics Geneva bedding collection. Select Bedding Size euro - 25"x25" Twin (T) - 71"x118" full/queen (T)- 95"x118" King (T) - 106"x126" standard (PC) - 21"x31" King (PC) - 21"x40" Standard (SH) - 20"x30" King (SH) - 21"x37"
The flat sheets and shams have an open hemstitch detail, giving the Victoria collection it's reputation of elegancy and luxury.